One of my favorite things to plan for a trip is where and what to eat. That's normal right? To plan a trip around food? Tulum offers no shortage of fabulous options for places to eat and drink. Some keep it simple (tacos on tacos on tacos) and others make you feel fancy (hello Hartwood). All of them bring the delicious. Enjoy! Let's start with the big kahuna. If you go to Tulum and don't eat at Hartwood, foodies of the world will scorn you. The restaurant is set in the jungle along the beach strip. The seafood is freshly caught, the produce is harvested from local markets, everything is cooked in a wood fire oven, and solar panels power the place. It's a little slice of sustainable heaven, and is absolutely worth the hype. Due to its divine reputation, we read a lot of reviews saying it's nearly impossible to get a table at Hartwood if you don't arrive at 5pm to stand in line (the restaurant opens at 6:00). We did just that and were actually seated right when they opened — a miracle! If you get there closer to 6:00 or after, you will probably have to put your name on a list and come back later. Point is, yes, it's worth it to arrive as close to 5:00 as you can. They do eventually cap the number of reservations for the night, and the restaurant closes at 10pm — so if you snooze you lose. Also note that Hartwood is closed on Mondays and Tuesdays. But on to the food! To quote the Hartwood website, the menu "changes daily based on the sea and land that offer us new harvests each day." How's that for poetic jungle-hipster magic? Some of the highlights of our Hartwood eats include fresh ceviche, colorful salads, grilled calamari (our favorite! ), and a couple scrumptious fish dishes. I highly recommend ordering a slew of plates to share. At a place this renowned, why not taste as much as possible? To stick with the classy, jungle-side spots, you gotta go to Gitano! It's within walking distance from Hartwood, so it's perfect for a post-dinner drink — or while you wait for your Hartwood table. I'm more than a little obsessed with Gitano. While Hartwood is full-on rustic, Gitano brings the jungled glam. Neon blazes the way to a wonderland of sprawling couches and tables set under strings of lights and crystal chandeliers swaying in the verdant canopy. There's even a giant disco ball! The experience was unreal. Drinks are on the pricy side for Tulum, but they're beautifully presented and worth it for the atmosphere. Now to take it down a notch on the glam scale, but up a hundred notches on the taco-taco-taco scale. We went to two taco joints while in Tulum, both bomb.com and both located right downtown on the main drag. We sat and ate at El Ñero and had a blast hanging out, ordering five of everything, and loving every face-stuffing minute of it. Here the beef taco was our favorite. But they're small — get yourself one of each type of meat. You'll be glad you did. We went to Antojitos la Chiapaneca to grab tacos to go on our first night in Tulum. You can eat there, but when you have a pool and five bottles of wine waiting at your spacious airbnb, well, do the math. The al pastor was our favorite taco here, and we would all advise against the steak (too chewy). A note about sauces: They are HOT. They're hot at El Ñero, too. Just assume any sauce anywhere in Tulum is going to be hot. Better safe than sorry. On the morning of our cenote swim, we had breakfast at Burrito Amor. We drove past it daily on our way to and from our airbnb, as it's located on the far end of Tulum's main street. Burrito Amor is an inviting, open-air café — definitely more trendy and new than the historic Mexico vibe found throughout the rest of downtown. Yes they serve breakfast burritos, but Burrito Amor is actually very much geared toward health-conscious, produce-loving, juicing types. They sell fresh juices, for one, as well as smoothies, burritos, and burrito bowls filled with fresh deliciousness. Two things: The cinnamon roll smoothie is a drink I will always cherish. Vanilla almond milk, banana, cinnamon — yum! The vegetarian burrito is fresh as all get out — but to be honest, the insides could use some salt. For how pretty it is, it was a little bland. However, there's a bunch of house-made sauces at your service to pump up the flavor — the creamy chipotle sauce was our favorite. My friends and I definitely fell for this place, so much so we went twice. Just off of the main drag in downtown Tulum, you'll find Batey's rustic charm and its signature mojitos and guarapos — a drink I'd never heard of. It's a delightful mix of fresh sugar cane and lime juice that's even better with a sprinkling of chili powder. Mmmm. That was our first trip to Batey. Our second trip was for breakfast on our last day in Tulum, where each meal comes with coffee and fresh orange or lime juice. If you're lucky, you'll catch some live music! Yep, live music on a Tuesday at 10am. Can we do this every day? Hotel Tiki Tiki was located just a couple blocks from our airbnb, so we stopped there one night for pre-dinner drinks. The bar and pool area are crisp, mod, and unlike any other spot we visited in Tulum. It was like we stepped back in time to 1960s Miami Beach. Now, if you're staying on the beach strip, would it be worth the trek to Tiki Tiki? Probably not. It's out of the way. But if you're close enough to stop for a quick drink, it's certainly worth it. In case that's not enough, here are more ideas for eating and drinking! There were lots of places we had on our list that we just couldn't get around to. Here they are so you can check 'em out for yourself: Cetli, Ki'Bok (coffee shop next to Batey), Zamas (beachside bar), Taqueria Honorio, Restaurare, El Tabano, and Posada Margherita (fresh seafood and Italian dishes). A couple other shout-outs that didn't warrant a full description: Casa Jaguar, Las Estrellas, and Ziggy's — all on the beach strip. Casa Jaguar is on the Hartwood/Gitano level and within walking distance from both. It's smokey, rustic chic, and nestled in the jungle. We had some after-Gitano drinks here and it was muy bien, but pricey for Tulum. This is definitely a spot catered to tourists. Las Estrellas is a beachside hotel restaurant, where we shared some apps and a bottle of wine before capping off the night with dinner and more wine at Ziggy's — another beachside restaurant. Honestly, I bet you could pick almost any hotel restaurant on the beach strip and you'd end up having a nice, fresh dinner in a relaxing, beachy setting. You can't really go wrong with thatch over your head and sand beneath your feet. Obsessive planners, check out the logistics & itinerary of our Tulum trip for tips on car rental, where to stay & budgeting your time. There are two types of people in the world: People who love planning and people who hate it. My friends and I mostly love planning, so our google doc was filled with ideas for Tulum that fairly easily translated into a fabulous four-day itinerary. I say four-day, but it was really three full days. However, we packed in some good eats and hang-time during the bookends of our trip, hence four-day. We flew into Cancun airport, rented a car, and drove 1.5 hours to Tulum. Flights from Milwaukee were expensive; taking the red eye out of Chicago was more timely and cost effective. Yes, in Tulum you do need a car. People claim you can bike from downtown to the beach, but it's a haul. And it's so hot. And if you're staying in an Airbnb and want to grocery shop, you definitely need a car. Also, Uber isn't available in Tulum and taxis are hard to come by, unless you're staying on the main drag. We went to a neighboring hotel to try and hail a taxi one night, and even the hotel receptionist had trouble getting someone to pick us up. As for safety: We were told there are "no rules in Mexico!" and read horror stories of corrupt cops pulling over U.S. tourists and taking them for all their cash. While I can't say that will never, ever happen, I can say nothing even close to that happened to us. I will also say that it's probably best to have a fearless driver among you. I am not a fearless driver, so I was grateful to have my New York friend Rachelle at the wheel. "This is like driving in Brooklyn," she said. I also imagine if you don't mind driving in Chicago, you'll be fine in Tulum. We loved our airbnb! It was located about a five-minute drive from downtown Tulum — off the beaten path, but within two blocks of Holistika (a gorgeous jungle retreat center) and Hotel Tiki Tiki, which has a beautiful bar that's open to the public. We loved that it was away from the busy main drag downtown, and that we got more bang for our buck than a hotel on the beach. See, there are two main areas to hang in Tulum: Downtown and the beach. Downtown Tulum is fun and bustling. You'll find amazing, cheap tacos, shack-like bars and cafés, and touristy shops shilling Mexican blankets, painted skulls, and colorful pottery. But it's definitely more gritty. There are lots of wild dogs and, at night, more sketchy characters to be wary of as a group of young women. Not that we ever felt unsafe, but I don't think I'd choose to stay in downtown Tulum. I'd rather be near Holistika, as we were this time, or spring for some beachside fabulosity in a nice hotel. And the beach strip is truly fabulous. Lots of hotels, restaurants, bars, and beautiful shops. This is the place to be as a tourist at night. There's much more to see and do on the beach, as opposed to downtown. Of course, you're also bound to spend a lot more money. When weighing the options of staying near Holistika vs. the beach, we opted to get more for our money: more space, a private pool, a full kitchen. You won't find all those amenities on the beach. But you would be within walking distance to all of the action! You will need cash all the time in Tulum. Many places — even nice restaurants — are cash only. If you run out, it's possible a business owner will also accept U.S. dollars. Here's an overview on how we budgeted our time. Arrive in Cancun and drive to Tulum. Check into airbnb mid-afternoon and lounge. Grocery shop (get all the bottled water, wine, and snacks!). Get cheap tacos from Antojitos la Chiapaneca for dinner, lounge some more, and make it an early night. Sleep in and do 10am yoga at Holistika. Then head to the beach (we googled and landed on Playa Paraiso as a destination). For an afternoon snack, visit one of the beachside cafés. At night, hit up Hotel Tiki Tiki for a drink, then do cheap tacos at El Nero for dinner. *Note: We tried to find downtown nightlife that wasn't a sleazy club, but failed. Nightlife is better at the beach! Get up early and see the Tulum Ruins or the Mayan ruins at Sian Ka'an. More details on this to come, but we did the Tulum ruins. They're touristy and crowded, but you end up at a beautiful beach making it all worthwhile. However, if you do Sian Ka'an, there is apparently jungle hiking, river floating, snorkeling, etc., in addition to the ruins. Pick your poison! At night, do the famous Hartwood for dinner, then bar hop on the jungle side of the beach strip. Go out for a yummy breakfast (we did Burrito Amor). Swim in a cenote. You can snorkel or dive, but we chose just to swim. 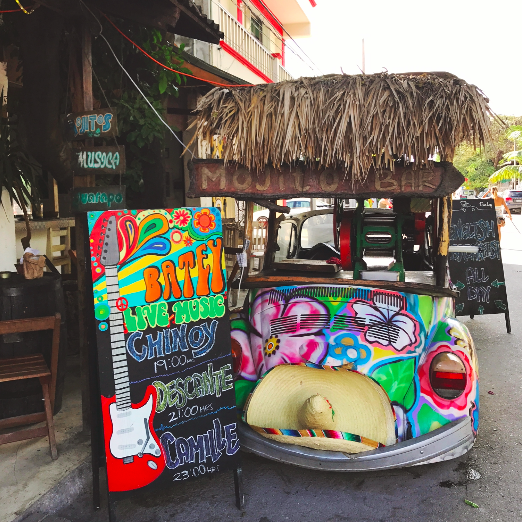 Bop around downtown Tulum to knock some souvenirs off your shopping list. At night, head to the beach side of the beach strip and bar/restaurant hop for drinks and shared appetizers/entrées. Wake up, pack up, and grab a tasty breakfast before driving back to the Cancun airport (budget time for traffic!). Everything in my suitcase still has that beachy, salt water and sunblock smell. My friends and I got back late Tuesday night from our highly anticipated trip to Tulum, Mexico. It's something we'd been planning for over a year, and something our other friends have applauded us for. Five high school girlfriends, 30 years old (or on the cusp), and we made time for something unforgettable. Excuse me while I pat us all on the back for turning dreams into reality. I hadn't heard of Tulum before our ringleader Rachelle proposed the up-and-coming town as a destination for our Year 30 trip. A quick google and the rest of us were totally on board — and Tulum didn't disappoint. I'll dive into the details in another post about where we ate, the sights we saw, and the things we loved, but here's an overview so that maybe you can start planning your next girlfriends vacation sooner rather than later. Start by renting an amazing airbnb located near a place called Holistika, a jungle retreat center with yoga and other mind-body programming. Our particular airbnb was outside of town by about five minutes, and about 15 minutes from the beach. You definitely need a car. Could you bike? Sure, but it's ungodly hot in the afternoon. I can't imagine biking being much fun, especially all the way to the beach. It was a trek, even in a car, and roads are narrow and not super friendly to novice bikers. Speaking of the beach: white sand, turquoise water. It's perfect. Though there's an entire road lined with beaches and beachside hotels, we didn't know which one to pick as a jumping-off point. Luckily a google search led us to a great one: Playa Paraiso. We lounged in the sand and swam in the surf before stopping at one of the shaded sit-down cafés to share apps and pina coladas. The eating and drinking in Tulum was, overall, an amazing experience. Of course don't drink the tap water! My friends and I were good about that and therefore avoided Montezuma's Revenge. Our favorite things we ate ranged from cheap street tacos to fresh-caught fish and jungle-foraged produce at the hippest restaurant in Tulum. Then there was the drinking – everything from coffee to fresh smoothies and lime juice stirred with stalks of sugar cane. Nighttime drinks were certainly beachy and beautifully presented. Whether sitting beachside under a thatched roof sipping rosé or nestled under a jungle canopy (complete with disco ball! ), the atmosphere for nightlife in Tulum is unreal. As for major daytime attractions, we ventured to the ruins (did you know aliens helped build them?) and a gorgeous set of cenotes, where I actually swam (look at me!) and dunked myself under water for the first time in at least a decade. If it wasn't already obvious, swimming isn't my thing. But Jess brought an underwater camera, which led to lots of mermaid-y photo-ops and entertainment. More details to come on exactly where we ventured in Tulum. For now, adios amigos! Folks use the phrase "hidden gem" willy nilly, but I think North Shore Boulangerie really is one. You have to venture to the heart of Shorewood to find it, and you'll be glad you did. Their pastries and baguettes are wonderful, and the atmosphere is utterly charming. I'd say "why aren't there more cozy corner cafés in the Milwaukee?" — but then I guess this one might not feel as special. Half of the café is a grab-and-go bakery and coffee shop, with little tables for resting to munch and sip. The other half is set with slightly larger tables for sit-down lunching and brunching. Adam and I have lucked out, always snagging a spot by the sunny front windows. The lunch and Sunday brunch menus at North Shore Boulangerie are simple and just French enough to make you feel a little fancy — a nice-casual date lunch vibe. I've only ever gotten the Dinde sandwich: sliced turkey, roasted tomatoes, fresh greens, aged cheddar, red onions, and aioli on country bread. It's so simple, but with fresh ingredients and house-baked bread with a tender middle and flaky crust, it's truly the best! Why complicate things? As for Adam, he's enjoyed the Croque Monsieur on our lunchtime visits to the boulangerie — heavenly, crusty, cheesy goodness. I'd get it myself if I hadn't fallen for the Dinde. See, it's hard to stray from your tried-and-true favorites at North Shore Boulangerie. But other goodies on the menu sound so scrumptious, I told Adam we just have to lunch there more often so that I can eat my way through the menu. For instance the Matin: bacon, aged cheddar, crispy onions, and smoked paprika aioli on a baguette with a sunny egg. Or the Eggs Florentine: roasted Roma tomatoes, baby spinach, and poached eggs on country bread topped with hollandaise. Pro tip: Share a croissant, almond croissant, or pain au chocolat from the bakery while you wait for your meal! Sound indulgent? Maybe. But sometimes you've got to live a little. Before heading into the Next Act Theatre last week, my understanding of The Other Place was somewhat vague. I knew it would be a “psychological mystery,” per the Next Act website, and that Sharr White’s play had something to do with a woman giving a speech, seeing someone in a yellow bikini, and somehow becoming unraveled because of it. I also knew the magnificent Deborah Staples would be playing the lead; that was truly incentive enough for me to see this show. Luckily, the vague story becomes clear and Deb Staples delivers a spectacularly raw and real performance as research scientist Julianna Smithton. Without giving away the crux of the story it’s hard to communicate the depth and dynamic shifts we see in Julianna, but I can say this much: Ms. Staples blew me away. From confident and salty to utterly lost and broken, the dramatic range she displays in The Other Place is remarkable, and often times terribly moving. 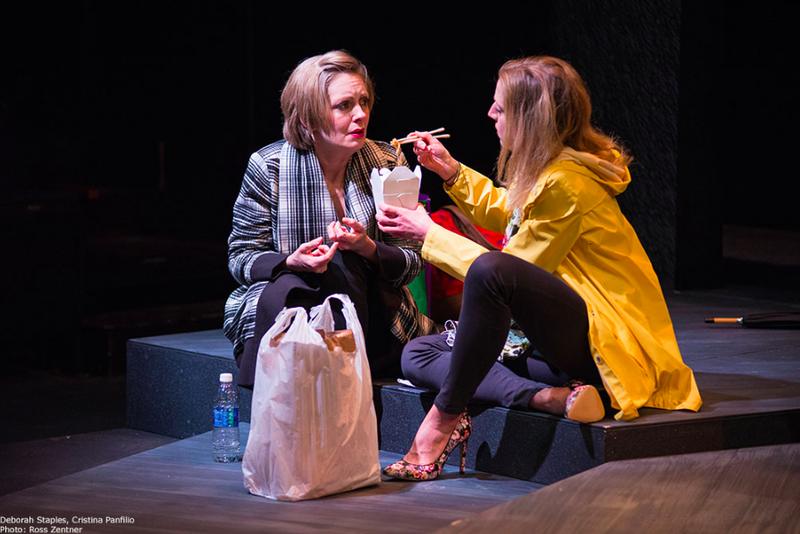 Though Deb Staples’ Julianna is at the center of The Other Place, I’m happy to say hers is not the only outstanding performance in this Next Act production. Cristina Panfilio took on three different characters with ease and grace, and some of the moments she shares with Julianna are especially tender. Those moments really made the show for me. And let’s not forget Todd Denning as Julianna’s husband, Ian — a caring, genuine man at his wit’s end. I realize I’m being annoyingly vague and haven’t given you much to go on plot wise. Variety called The Other Place a “haunting drama, so cleverly constructed that the nature and depth of the problem isn’t revealed until the last shattering scene.” Well that pretty much says it all — without saying much, if you get what I’m saying. 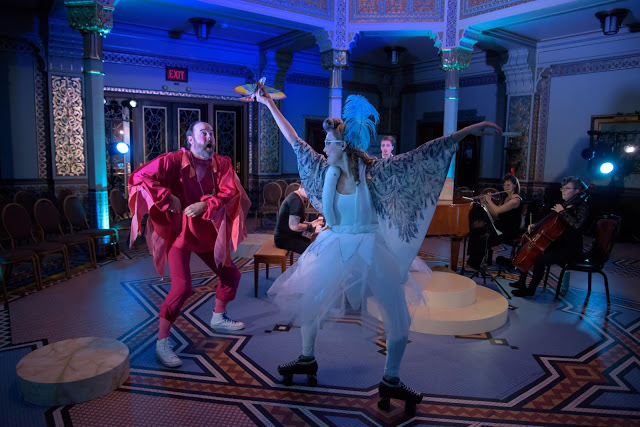 The point is that The Other Place, as performed by the incredible talent at Next Act, is so very worthwhile — and it’s also worth it to maintain the mystery going into it. When all is finally revealed, you’ll be wowed at the complexity of Julianna’s story and the cunning way it all unfolds. Oh, and you’ll probably need some kleenex. The Other Place is playing at Milwaukee's Next Act Theatre now through February 26th. Info and tickets at nexact.org. Nessun Dorma is a hole-in-the-wall (restaurant-in-a-house?) in Riverwest, known for its paninis, bruschetta, and (just ask Yelp) its artichoke dip. This place has spent an eternity on my list of eateries to try. Last weekend, the stars finally aligned for a date night dinner in this cozy neighborhood favorite. We arrived around 6:30 on a Friday night. Though there aren't many tables at Nessun Dorma (maybe 10? ), I was able to snag us a vacant one. The tables are first come, first served — so just grab an open one and don't wait to be seated. If you must wait, the bar isn't fancy, but it's a charmer. In fact the whole place is kinda like that — not fancy, but charming. Homey. Comforting. Neighborly. Adam and I decided on paninis for dinner. He went for the Puccini: Sliced beef tenderloin with capicola, sautéed peppers and onions, provolone, and Kalamata olive tapenade on Tuscan country bread. For me, it was the Portabella Philly: Balsamic-marinated portabella mushrooms, peppers, onions, and provolone on an Asiago ciabatta loaf with basil pesto mayo. Mmm. I'm sorry to say Adam didn't love his, but really that's his own fault. I warned him about olive tapenade (you had better really love olives! ), and did you notice the lack of mayo? If a sandwich doesn't have mayo or an aioli, pass. But I absolutely loved (and devoured) that Portabella Philly. So gooey-cheesy-saucy and full of balsamic-basil flavor! Being a compassionate girlfriend, I let Adam have some bites as well. He raved, as he should. When you pick the right panini, Nessun Dorma does indeed live up to the hype. You better believe I'm going back to try the bruschetta and artichoke dip. Making simple & sumptuous roast chicken provençal (twice!). Wearing this robe & these slippers every chance I get. 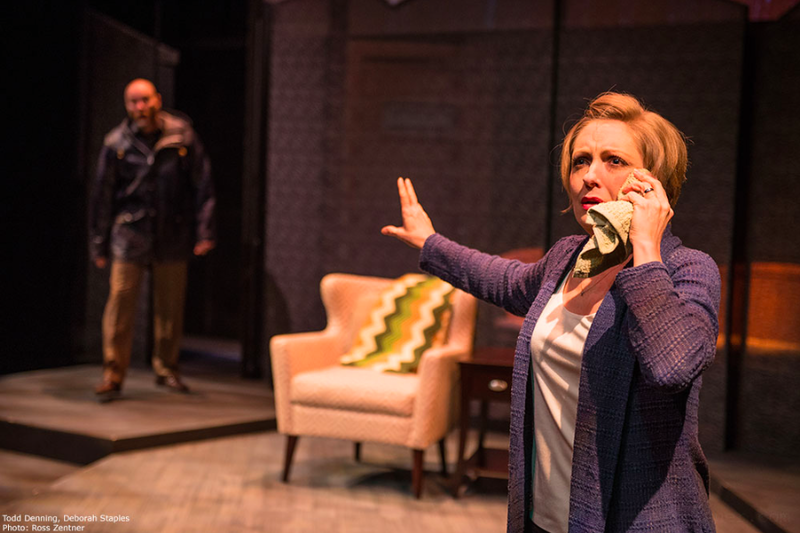 Seeing Disgraced at the Milwaukee Rep — playing through Feb. 12th! Cooking up easy-peasy Asian-style lettuce wraps. Discovering a new favorite dessert at Café Corazon. Seeing my first opera and loving every minute of it! Baking Pippin a birthday pupcake. Learning how not to fear homemade pie crusts at Palomino. Did you know you can take pie-making classes courtesy of Honeypie co-owner and Executive Pie Maker, Valeri Lucks? That's the ultimate offer from the maker of some of Milwaukee's most ultimate pies! I'd been dreaming of taking one of Valeri's classes for a while, but they're limited to 10 students per class; AKA they sell out in a jiffy. But I was on top of my game this January and secured three spots: one for my mom, one for me, and one for our Erin. The class was "NO FEAR: Crust Making 101," offered rather sporadically (once a month, tops). I was super psyched for this class! I love to bake but had never attempted to make my own pie crust. We arrived a touch before 6pm on a Monday night at Palomino, Honeypie's brother café with a larger, student-friendly kitchen. We helped ourselves to a drink (included in the $45 class price) and met our group in the kitchen. Valeri had everything arranged just so, with bowls, utensils, chilled water, flour, and aprons for all. We quickly got to work, diving into the hands-on portion of the evening. We mixed flour, salt, and shortening with just-enough ice water, taking care not to over-mix or warm the dough excessively with our hands. We spread and rolled the dough on a floured work surface, then laid the flattened slabs into a small pie tin. Our trio found lots to laugh about — like how ours were turning out much more crumbly and much less photogenic than others in class. Still, Valeri was always encouraging and insistent and there are ways to fix almost any mistake when making pie crust from scratch. Like, when in doubt, pop the dough in the fridge or freezer for a while before continuing to work. She also says that, though butter is tasty, a crust made with shortening is easier; that's what they use in almost all of their Honeypie pie crusts. Who knew?! Once we'd set the bottom crust into our mini pie pans, Valeri came around and scooped mixed berries into each. The berries were frozen, which apparently works better than fresh — not as watery. We carefully topped the filling with a second slab of dough, trimming the top and bottom edges to about an inch before crimping them. Then it was time for the pies to bake — about a 40-minute to an hour-long wait. During that time, the seasoned pie makers in class asked Valeri a string of smart questions. For example, did you know you should really bake a pie the day before you're going to eat it? That way it will actually be cool enough to be cut into neat slices. Also, baking on a heated cookie sheet or pizza stone will help keep a soggy-bottomed pie at bay. I personally asked if the restaurant's signature salted honey pie has sugar in the crust. Turns out, it doesn't! Valeri says that scrumdiddlyumptious pie is made with the same simple pie crust we'd learned in class. My mind is blown, and now I can't wait to try my hand at a salted honey pie with a homemade crust. As we continued to wait for our mini berry pies to bake, some students enjoyed a drink at the bar. Erin, my mom, and I took the opportunity to wolf down some of that delicious Palomino cooking: a handmade biscuit to start, followed by fried chicken dinners with brussels sprouts, broccolini, and spicy corn. I went for a salad topped with fried chicken thighs, veggies, and a drizzle of ranch dressing and buffalo sauce. Easily my favorite guilty pleasure salad. At the end of the night, Valeri brought out our piping-hot pies to take home. She advised us to leave the lids cracked so the steam could escape, otherwise the crust would get soggy. When I got home with my fresh, beautiful berry pie, Adam and I dug right in. The pie crust was perfect: warm, flaky, and the ideal vessel for those sweet winter berries. I'd love to go back for Honeypie's other pie-making classes, like butter pie crusts, fillings, handhelds, and more. Getting schooled has never been so sweet!